At its heart Egusi Soup, a play by Bruntwood Prize winner Janice Okoh, is a comedy-drama about a British-Nigerian family experiencing the familiar tension between the life they have built themselves in the West and the traditions that their mother, Mrs Anyia (Lorna Gayle), left behind. The trigger event that drives the action is the one year memorial for Mr Anyia. The suitcases are forever nearly packed and the family (if not the storm clouds) are gathering ahead of a trip back to Lagos to celebrate Mr Anyia and his legacy. It is clear from the outset that life is not quite the rose-tinted paradise that Mrs Anyia would like those in Nigeria to believe. The formal structure of Egusi Soup hints at Janice Okoh’s background, which includes an MA in Creative Writing and a place on the BBC Drama Writers Academy. It makes a refreshing change to see a two act play that takes place in an traditionally linear fashion. Flowing from scene to scene, the play moves confidently through the action and delivers a number of enjoyable set-pieces before building inevitably to a resolution where secrets are unveiled and resolution is found in forgiveness and acceptance. Okoh clearly knows these characters and Egusi Soup is anchored by Gayle’s performance as Mrs Anyia. Gayle treads a careful path between colourful stereotype and a wife who has lost the person who filled her world. Any slip into cliché is knowing and is offset by the sense that this is someone desperately trying to hold onto tradition as a way of holding onto her husband. This is drawn out of the smaller touches like the spare room that still holds Mr Anyia’s possessions and her willingness to believe he was poisoned rather than taken by cancer before his time. 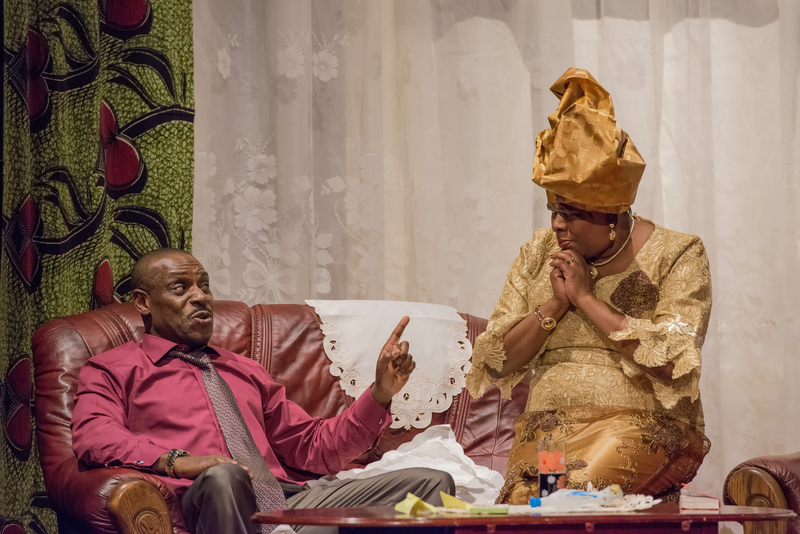 The comedy is primarily driven by the two male characters, Richard Pepple’s Pastor, Mr Emmanuel, and Seun Shote’s Dele. These draw on stock roles of the Nigerian entrepreneur and evangelical; they artfully mirror each other and serve to bookend the proceedings with light relief that, whilst firmly based in Nigerian culture, is accessible to everyone. Here Okoh demonstrates a subtlety in her writing; drawing out the strange duality in the two positions without overtly referencing it. Mr Emmanuel being a fine entrepreneur and a man who sees opportunity everywhere, whereas Dele is a hopeless businessman who is happy to turn to religion as the answer to his financial and fertility worries. The two remaining parts are the daughters of Mrs Anyia, Gloria Onitiri’s Anne and Anna-Maria Nabirye’s Grace. They are more problematic roles and, despite being the dramatic centre of the play, have a tendency to fade into the background in the face of the verve shown in the other performances. Part of the problem is that whereas Dele and Mr Emmanuel come close to caricature, they are fundamentally comedy roles and so we accept them on those terms. 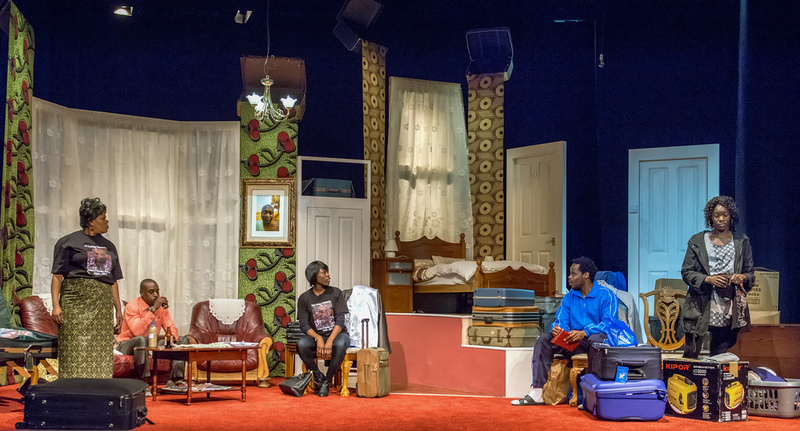 Grace and Anne struggle to avoid being ciphers for the pressures on British-Nigerian families and it is only at the end of the play that they begin to be seen in their own light. The play itself relies on the prodigal son myth. In this case it is Grace returning from America and her high-powered job as barrister. It is clear that she has lost touch with her roots, whilst Anne who has remained at home has married Dele, a traditional man from Nigeria. Over the course of the play they begin to learn more about each other and about themselves. It is well-acted throughout and the set, by Nicky Bunch, is a model of how to make functional design alive and lived-in. It makes full use of the Albany stage and allows for self-contained scenes to take place without breaking the fluidity of the action. 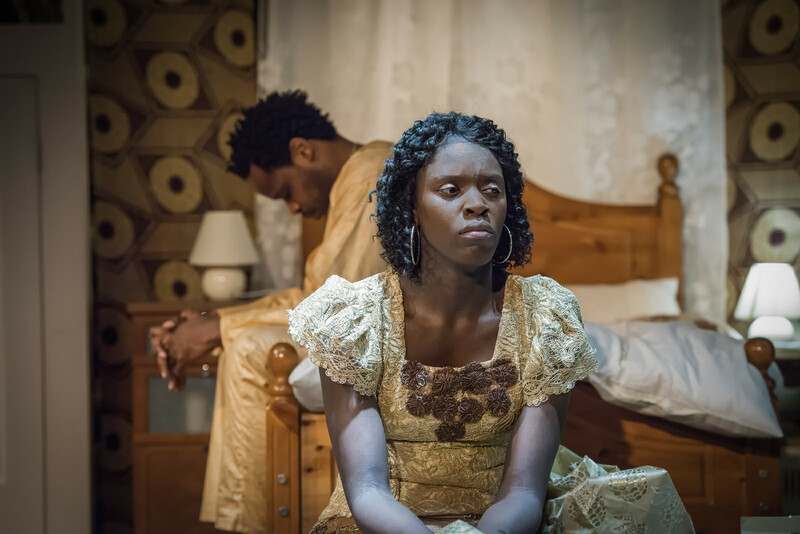 Clocking in around the two hour mark, plus interval, the play could use some judicious editing, as there are times it feels slightly inert and lacks in dramatic impetus, but overall Janice Okoh has created a well-rounded and solidly structured piece that shines a light on lives that rarely make it to the British stage.